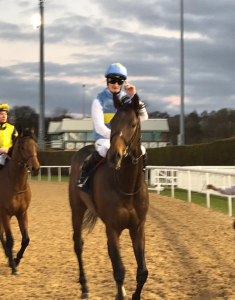 The 4,500gns yearling purchase Dark Miracle, broke his maiden tag on Tuesday when landing the 6.30 Ladbrokes Home Of The Odds Boost Novice Median Auction Stakes at Wolverhampton Racecourse. The three year old son of Mukhadram made all in the 1 mile contest before quickening up well in the final two furlongs and going on to win comfortably by three lengths to the second placed horse Just Benjamin. We are delight to give Mr Hunor Szabo his first winner as an owner and are pleased with how Dark Miracle has come out of the race this morning.